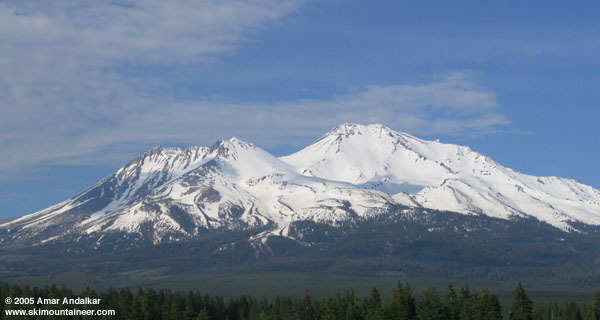 Shastina is the oft-ignored and underappreciated satellite cone of Mount Shasta, completely overshadowed by its towering parent. Nevertheless, Shastina is the third highest volcanic cone in the Cascade Range at 12330 ft, exceeding even Mount Adams in height, and is certainly a worthy mountaineering and skiing objective. Cascade Gulch provides an easy ski route all the way to the summit, while excellent moderately-steep and lengthy ski descents can be found on the South Face, North Face, and Diller Canyon (west side). The NE Face above the Whitney Glacier even offers some very steep extreme skiing terrain. I'd wanted to ski Shastina for several years, but had been thwarted by overpowering winds (70+ mph, too strong to even stand upright) at the 11840 ft Shastina Saddle during my only previous attempt in May 2003. After skiing to 12000 ft in Avalanche Gulch the previous day (see TAY report), Corey Bloom and I planned to try Shastina on Memorial Day. I was quite tired as we awoke at 6 AM at the Bunny Flat trailhead, but my spirits were lifted by the mostly clear skies and calm winds, the nicest weather of the entire long weekend. We skinned uphill around 7:30 AM, just in time to see the last members of our big group (Jessica, Chris, and Kevin) returning to the trailhead from an extra night at Horse Camp. Continuing on to the camp, we located a good skin/boot track heading north and followed it on a lengthy rising traverse all the way to Hidden Valley at 9200 ft, with ski crampons helpful on the frozen west-facing slopes. Hidden Valley is an exceptional place, a large flat plain at the foot of the West Face with nice protected camping spots and surrounded by excellent ski terrain on three sides. We skinned up the left side of Cascade Gulch on softening snow on the south-facing slope, eventually finding firmer snow and moderate winds as the Gulch flattens above 11000 ft. We reached the 11840 ft saddle by 1 PM, winds were strong enough to hide behind a large rock in order to eat lunch, but certainly not the hurricane force I had experienced 2 years earlier. We continued skinning up the east face of Shastina above the saddle to the crater rim at 12100 ft (panoramic view looking back at Shasta, the upper Whitney Glacier, and the ridge up to Point 13384). Shastina's summit has several volcanic craters and cones, with the main summit cone rising above the crater rim (see wide panoramic view). A straight route over to Shastina's summit cone would involve losing and regaining over 100 ft, but a traverse to the right allowed us to skin to the summit with minimal elevation loss, finally following an interesting narrow ridge from the north to the true summit just after 2 PM. Clouds had begun to boil over the summit from the north, often threatening complete whiteout, but clearer skies and breaks of sunshine prevailed to the south. Given the imminent foul weather, we quickly got ready and skied off the north side of the summit, immediately cutting to the right and onto the south side, weaving our way through rocky areas on slushy snow to the crater rim and the top of the South Face. Here things got really nice, the snow became good corn and the face held a consistent 30-35 degree pitch for over 1800 vertical ft down into Cascade Gulch. The snow turned to heavy glop by the time we reached Hidden Valley, but the ski out to Horse Camp was still quite easy and fun by following the morning's skin track. Another quick ride down the ski trail brought us out to Bunny Flat by 4 PM. A very fine day, 5400 vertical ft of ski ascent to and ski descent from the true summit of Shasta's largest satellite cone. View of Shastina (left) and Shasta from the WSW at the Abrams Lake exit on I-5. May 31, the Anticlimax: Well, the snowpack is largely gone on Glass Mountain, so the ski run there didn't happen (although we could have yo-yoed various patches of several hundred vft). We returned to Klamath Falls to check the forecast online at the library, only to discover that the freezing level on Shasta was now forecast to plummet to 9000 ft or lower by Wednesday, with upper level low pressure likely producing high winds aloft. Despite continuing clear or partly cloudy skies, it would certainly be fruitless to try to ski anything big from the summit of either Shasta or Shastina in such conditions. After several hours of indecision in the face of the depressing new forecast, we decided the best course of action was just to pull the plug on the whole road trip and return to rainy Seattle. After a quick dinner, a 7-hour drive (including several hours of heavy rain after crossing Willamette Pass) brought us home by 1:30 AM. Excellent report, thank you Amar! Your photo of Hidden Valley is the best I've seen showing the West Face Gullies route, which looks mighty scrumptious, and genuinely makes me want to dial in sick and pack the freakin truck right this very instant. Do you have any estimates based on your frequent experience w South and West sides of Shasta how long the W Face Gullies might stay in that kind of shape? Seems like given their W facing these would be a good choice for a oneday from car ski ascent on a day with high FLs. Well, this is the most snow I've ever seen as of roughly June 1 on the upper parts of Shasta above 8-9000 ft, exceeding even the very deep spring snowpack of 2003 (although I missed out on the huge spring snowpacks of 1995 and 1998 in CA, which may have been deeper than this year). See this photo from June 3, 2003 for comparison, clearly less snow than this year. In 2003, the central West Face Gully remained a continuous ski until the final days of June, so unless there is a big heat wave soon I would expect the West Face to remain a fine ski descent into late June or early July this year. The three main rock ribs which divide the face should become increasingly snow-free over the next couple of weeks, unless there is additional snowfall. I think that the fastest and most efficient way to ski the West Face is to go up Avalanche Gulch to the base of Misery Hill at 13200 ft and then traverse west, it's a much shorter route and since it softens earlier in the day it might provide an easier ski ascent than the West Face (plus the Gulch usually has a nice boot pack to climb if forced to put the skis on the back). The West Face remains firmer later into the afternoon, so 1-3 PM is often a good time to ski it with typical spring FL of around 12-13000 ft. I also want to THANK YOU for all the great info and links on your website. During my 2 plus months of skiing around Tahoe and the Sierras, I would constantly use the links provided on your site. Jill and I used the 31st as a travel day from Lassen to Shasta due to the forecast. The wildflowers were incredible and Jill was happy. We spent the evening of the 31st on the Everitt Memorial Highway and the winds were strong and the clouds periodically encased Shasta. June 1st was a beautiful day and we skied Giddy Gulch in perfect conditions. Based upon your reports, I have wanted to ski Mt. McCloughlin and planned that for June 2. Unfortunately, the weather was not cooperating and we have to try again on our next trip. We are skiing the Three Sisters Wilderness for the next couple of days.